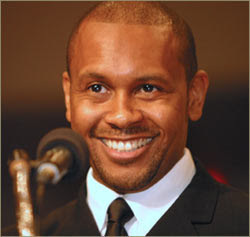 Kevin Powell had a long election campaign running for Congress here in New York. He didn't let that defeat get him down. Powell has signed a two book deal with Simon & Schuster to release his own memoir, "The Boy With A Mother And No Father", to be released Fall of 2012. After releasing his memoir, Powell will take his collection of history and archived interviews to release "Tupac Shakur: The Authorized Biography"
To read statements from Kevin Powell about the biography, click here.